In an ideal world, your customers would be satisfied with every product you deliver, the first time you send it to them. But sometimes clothing doesn’t fit, electronic devices don’t work properly, or furniture clashes with a consumer’s decor. The reality is that e-commerce returns can be a difficult area to navigate. It’s important to keep in mind that a merchant’s return policy completes the online shopping experience, and plays a big role in determining whether a shopper will purchase from the same merchant again. Our findings from a 2016 survey with over 6,000 Canadian online shoppers, suggests there are three ways a returns policy can help, not hinder, your online sales efforts. A clear returns process sets an expectation upfront of what a customer is able to return, what they need to do to be successful, and how they will be compensated in terms of credit, exchange, or refund. Ease of doing business is a significant factor in influencing customers to do business with you. Returns policy terms should be easy to find and understand – don’t make your customers hunt for it. It’s best to be clear about the conditions of a return, including definitions of acceptable timeframes, and the state the product needs to be in if returned (in original packaging, unworn, price tags intact, etc). Shoppers are looking for this information upfront. Our survey found that 18% of shoppers abandoned their cart before making a purchase due to concerns over a returns policy. That’s a 5% increase from a study we completed three years ago. This highlights how providing a clear and transparent returns policy early in the buying process is important to completing the sale. Even before a first-time customer makes a purchase on your website, a concise returns policy provides the peace of mind needed to convert browsers to buyers. Either way, prospective customers want to know they get full value for their purchase on your website. Review some of your competitors’ websites, or leading e-commerce websites in your industry. You might have similar returns practices already; it might be a matter of where customers can locate it. When a customer sees an obstacle-free path to returning their purchased product(s) to you, their perception of the overall returns experience starts on a positive note. Aim to remove any barriers your customer could face, and have minimal restrictions, rules or fine print to achieve a simple returns process. Your primary goal as an e-commerce merchant is to sell your products and, while it varies by industry, a small portion of items sold will inevitably make their way back to you as returns. Protect your reputation with a simple returns process. Evaluate your returns policy from your customers’ point of viewand determine whether the rules are helping or hindering the customer experience. Canadian online shoppers prioritize returns as a key factor in judging their online shopping experience. 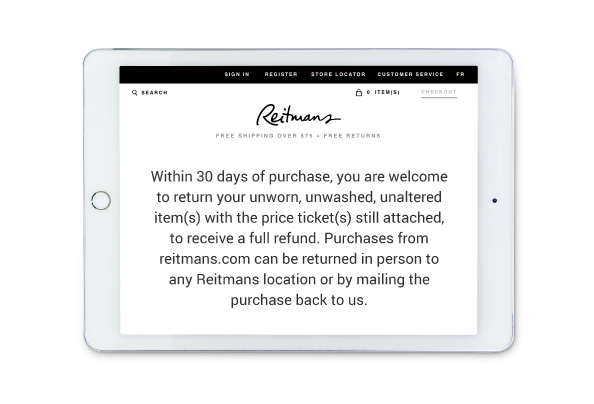 A convenient returns process provides shoppers with options to get that purchase back in your hands – across channels. No two shopper journeys are the same! By providing flexible options, you can guarantee a convenient experience for the shopper looking to make a return next time they’re at the mall, or for someone without access to your retail location. For businesses with multiple physical store locations, allowing customers to return products to the location nearest them can drive in-store sales, increase customer confidence, and lead to future sales. How can online merchants offer an ideal returns experience? Consumers buy products online because of the ease of receiving their purchase at home, at work, or at their local postal office. If your business makes it convenient to return defective or undesired products, you build brand equity with your customer, their friends and family. Think of your returns policy as a driver of sales and repeat business by removing a key barrier to purchase. It’s also an important way to build trust with your customer by telling them you understand their concerns and support them in their decision to request a return. 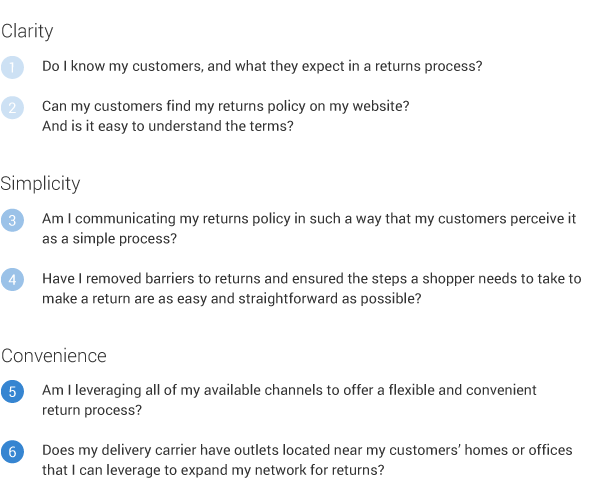 By asking yourself these questions, you can start to evaluate areas of opportunity and improvement in your returns policy, helping you meet your goals of converting browsers to buyers, and delivering an engaging customer experience to encourage repeat visits and sales. Remember,your business doesn’t need to have a perfect returns policy in place overnight. You can take small, incremental steps towards improving your returns policy over time. Discover our solutions that help drive business efficiency and satisfied customers.